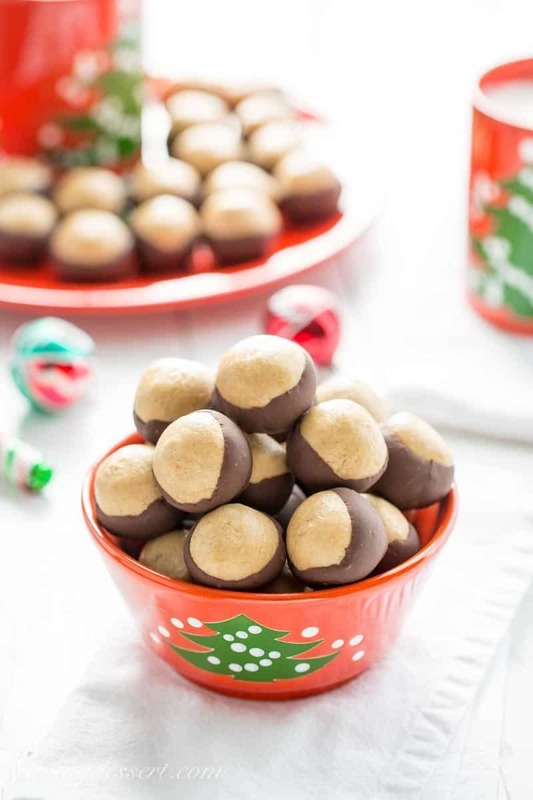 With just a few pantry ingredients, it’s amazing how each Buckeye Candy recipe can be so completely different. I adore the perfect balance of sweetness, creaminess and flavor and LOVE the snap of the cold chocolate when biting into a Buckeye. Some recipes add coconut oil to the chocolate used for dipping, and while it makes the chocolate silky smooth and creamy, it’s not as crisp and substantial, which is how I prefer the coating. 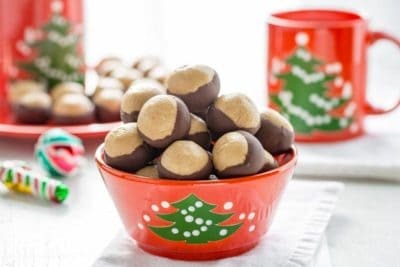 I lost my old go-to recipe years ago in a tragic and heartbreaking recycling accident and have been looking for the best Buckeye Candy recipe ever since. While developing this recipe, I made numerous batches testing with less sugar, more peanut butter, and more, or less unsalted butter. 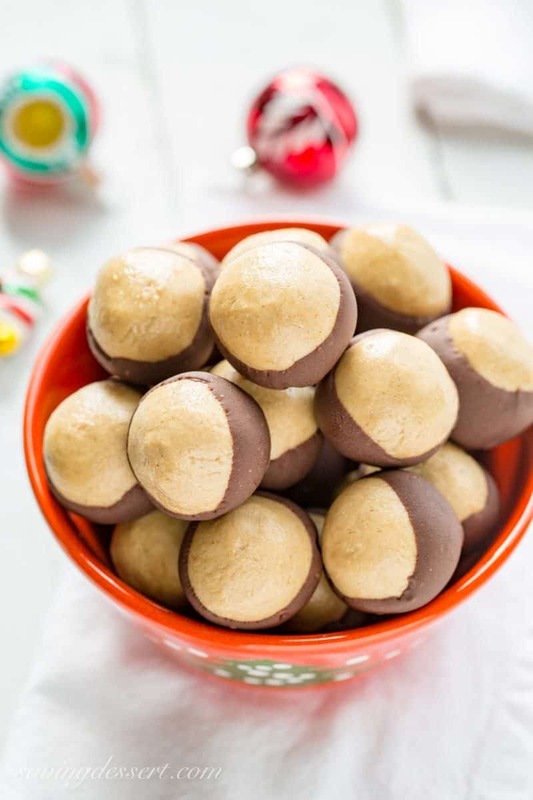 The final perfected recipe posted here features a simple secret ingredient that made all the difference in the texture of the peanut butter dough balls. I added a few crushed saltine crackers to the dough to add just a touch of salt, and to keep them a little drier, and less greasy. Peanut butter and butter can be a greasy mess if not balanced with the right about of powdered sugar and in this recipe, saltine crackers. These peanut butter balls have a perfect texture. They hold their shape, freeze beautifully and taste amazing! Nobody can tell I added saltine crackers to the dough; you really can’t taste them at all. The combination of peanut butter and chocolate is hard to resist, at least it is for me. Who doesn’t love peanut butter and chocolate?! Our Buckeye Candy can be refrigerated for up to a week, or frozen for up to 1 month. They’re the perfect easy make-ahead treat! We love these straight from the freezer; they’re soft and easy to eat while frozen, and last longer on the dessert table. One word of warning, they’re a bit addictive and that makes it’s hard to stay out of the freezer until you’re ready to serve! I wouldn’t try to ship these as they need to stay cold. Microwave 1 cup of the semisweet chocolate chips in a bowl on 50% power, stirring halfway through, until melted, about 1 1/2 to 2 minutes. 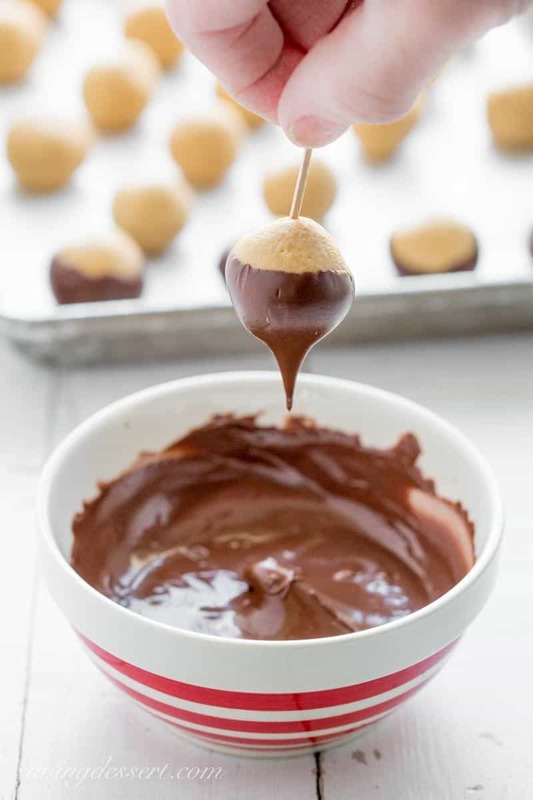 Using a toothpick, dip chilled balls into the melted chocolate, leaving the top third of the balls uncovered. Return the Buckeyes to the lined baking sheet and refrigerate until the chocolate is set, about 1 hour. I find it best to place the bowl of melted chips inside another similar sized, but larger bowl half filled with hot water. Because we’re dipping cold, frozen balls of dough, the chocolate cools quickly and it’s much harder to coat the balls. Keeping the chocolate warm makes the process go a lot quicker. Take care not to over microwave the chocolate as it can seize up and harden. 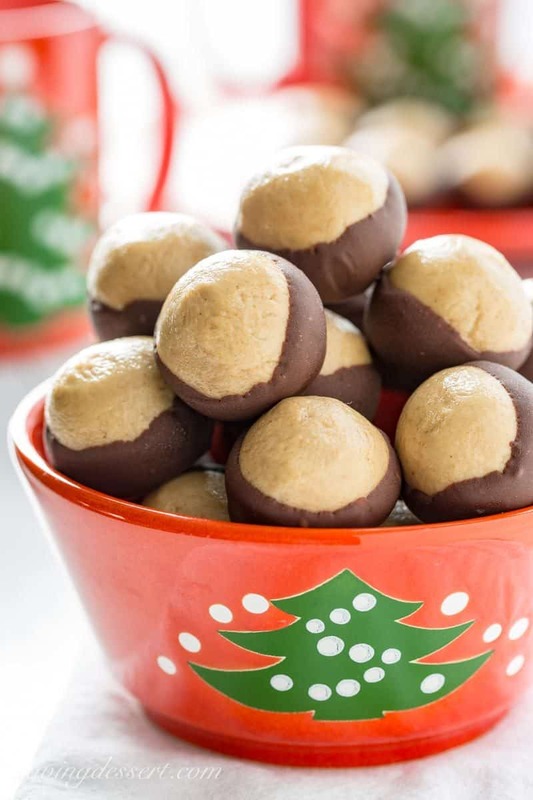 Once all the balls are dipped, the frozen peanut butter balls will have softened enough to close the toothpick hole easily. Saltines, how interesting! I love sweet and salty so I already have a pretty good idea that these would be a huge hit! Thanks for all the testing, now I don’t have to! Hi my fellow Buckeye! I was born in Columbus and grew up on a farm in Pickerington. I’ve made Buckeye Candy many times, but this is the first time I’ve seen saltines in the recipe. Sounds good, Tricia! Many years ago, my dad gave me a handful of buckeyes and I carry one in my purse to this day, for good luck. You’re right… The eye of the deer, hetuck, Indian word, means eye of the buck, was the way I learned it. So many variations of the candy and I have to try your version. Thanks! One of my all time favorites from when I was a kid! I’m always trying to find just the right recipe for them- and I have a feeling this might be the one! Can’t wait to try! I have never seen anything like it, they look absolutely delicious . Thanks Gerlinde – if you love a peanut butter / chocolate dessert, these are a must try! Looks like all that research paid off! Love these delectable beauties! I have never made them..something to look forward to! Thanks! If you love peanut butter and chocolate, these are a must make 🙂 I bet your grand boys would love them! Beautiful and of course, delicious! Great idea to add Saltines 🙂 Will be trying these! This has got to be my favorite combination and the ultimate dessert. I love the Saltines trick, and I bet Ritz Crackers, which I always have around, would work, too? Pinning and sharing these treats! I bet they would Sue, but may taste a bit different. Saltines have such a subtle flavor, but I would be willing to bet Ritz would be great too! So simple, yet so awesome and festive! What else can I use instead of saltine? What about seed crackers? Hi Angie – anything that crumbles to a fine powder would probably work. It would not be the end of the world if you left them out all-together, but I really love the extra-something it gives the texture. Thanks!